Great for personalising any hen party, from gifts to printed ribbon decorations, custom printed sashes, ribbon banners, lanyards and more. We can print ribbon with text and graphics in a wide variety of colours, fonts, widths and ribbon types. Hen party sashes are very popular and we can personalise yours with names, messages and graphics to suit the occasion. With a wide range of bright and beautiful ribbon and fonts, you can be sure that you will stand out on your hen party night. 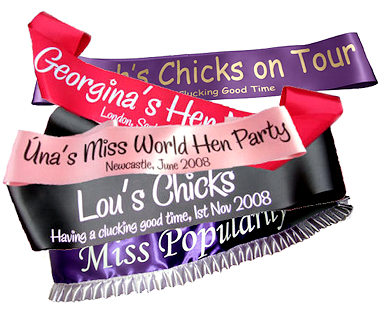 You can even print in metallic, for a cost-effective but luxurious looking finish on your hen sash. You tell us what you want and we will make it!